The double walled stainless steel Montiico bottle keeps cold up to 24 hours! Great bottle for all age groups and with a pop up sports lid making it easy to drink from as well. Easy to carry around so perfect for sport and school. Due to the double walled stainless steel it keeps cold for up to 24 hours. 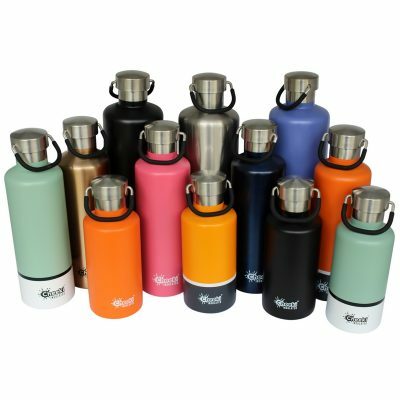 Comes in 3 bright colours in the 350ml and 5 bright colours in the 600ml – all done in a scratch and dent resistant finish. Hand wash recommended and very easy to clean. Size 350ml – 20cm (incl lid) x 7cm. NOTE: The sports lid is not intended for children 3 and under. Not intended for teething or chewing. Always ml use this product with adult supervision. Always ensure the silicone valves are properly installed. Adult assembly required. Do NOT use with hot liquids. For an extra $5 you got the option of getting a name/text permanently marked on the lid.